The readers of Bernard Moitessier’s firsts books* have certainly noticed this particular character, whose do-it-yourself attitude shows glimpses of pure genius. In the fifties, between Durban and Cape Town, an inevitable friendship grew between the two sailors, who shared a bohemian lifestyle, the art of makeshift, and an indomitable sailing instinct. From the Caribbean Islands Henry crosses the Atlantic Ocean and reaches the UK, where he finds a job and gets married to Ann. 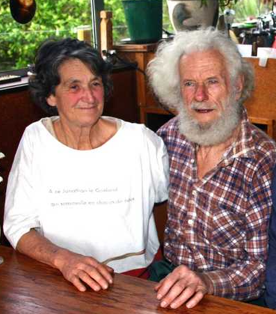 Always aboard Wanda, the couple sets sail to Marseille, where they meet Bernard and Françoise who are preparing the world famous Joshua (Bernard will later write that Henry, in order to help them, did the whole engine installation in just a few days and without even docking the boat!). During the same period, since Wanda was too small for a live-aboard couple, Henry decides to sell her. With an incredibly adventurous spirit Henry buys (very cheaply) his first steel hull: 10m long, directly from the sea floor! Laboriously re-floated -thanks to Henry’s craftiness and determination- in just a few months and with very little money the wreck becomes ” Shafhai ” **, a sailing ketch that during 1962 serves as school boat along with Joshua, in the aim for both couples to feed their respective piggy banks. During the following winter Henry decides to repeat the “exploit”: this time the target is a 15 m steel hull, built in Amsterdam in 1936, which he saves from the fleet and transforms into another “new” ketch: the “Pheb” ***. Even his most confident friends are amazed by the speed in which Henry makes a success of this new challenge, and next year, after the sailing school season in the Mediterranean Sea, Pheb is ready to carry Henry and Ann through the Atlantic Ocean. A 41m steam vessel built in 1911, refitted in 1951 – When 2 diesel engines were installed- and definitively put out of service in 1963. At the beginning of its dismantling, the hull manages to “escape” from the harbor by breaking its mooring lines during the cyclone Ines in September ’66. It sadly ends up washed onto a sandbank. At this stage, not even for the swashbucklers it would be profitable to rescue it…but for Henry Wakelam it´s just the beginning of a new adventure. In seven years of titanic work, almost alone (because Ann was mostly taking care of the children), Henry builds an impressing three masts schooner, which he baptizes Nahoon. After some offshore passages between Martinique and Guadeloupe, in ’76 the maritime administration starts asking for the vessel’s papers… Henry and his new girlfriend Babette find themselves having to leave, as they could not afford to pay the taxes for a boat that size. They decide to set course to Trinidad and Tobago. 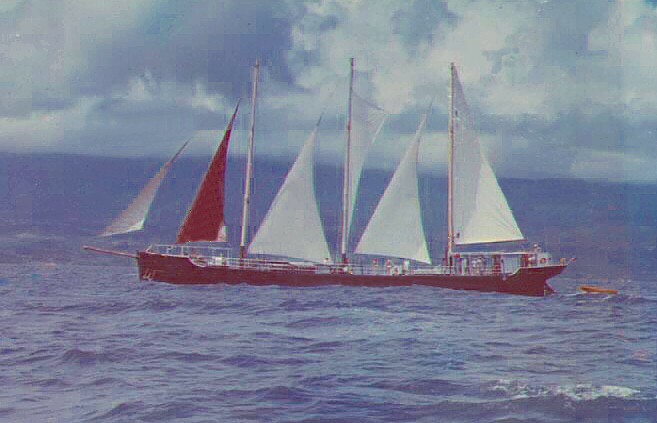 After a few years of Caribbean wanderings and escaped hurricanes, exhausted by Nahoon’s maintenance, Henry begins the construction of a smaller boat: Operculum, a 42ft polyester made, with which in 1984 (once the Nahoon was sold to Californians which thought of transforming her into a restaurant) he sailed all the way to New Zealand, where he still lives nowadays. To receive his answer (four hand-written pages) was very moving, but reading it pleased us even more… Very lucid and still in good shape in spite of his 80 years of age and a car accident which in 2007 caused him a <<broken collarbone, starboard ribs pushed into diaphragm and port lung, broken pelvis and port leg>>, Henry underlines that he is still totally independent, and that before needing somebody to take care of him he´ll definitely prefer to blow himself up with a charge of dynamite. He’s very satisfied with his small house, his garden and especially his workshop, equipped with everything he needs, including a lathe! He continues to dedicate himself to the highest standard of do-it-yourself, always looking for THE simple Invention (he already holds two patents). Now we are even more anxious for the work to come to an end, as when we´ll finally be able to leave we´ll definitely have one major destination: New Zealand, where we can meet him personally! PPS: Henry Wakelam left this world on April 14th 2017, one year after his wife Yannick. Mu bonita la historia,mucha suerte en el trabajo………ma…no muchos viajes he? Very interesting article. Is it possible to contact Henry Wakelam direct ? My father was his half bother : Leslie Harold Wakelam. Kind regards Steve Wakelam. Henery Wakelam is one of the boat building/restoration geniuses of the last century. He did it all and never wrote anything about it. It is wonderful to know that he is still alive and pursuing his projects. I am one of his great admirers. Hello Henry, I came across this article by accident. Your Wife,Ann,was my cousin and I have heard so many stories of how you sailed the seas and how you raised and restored what seemed to be lost vessels. I was very fond of your son,Paul and was very saddened by his death. I wish we could have met. I have found this page after a search of the name Henry Wakelam, which Bernard Moitessier refers to en passant on La Longue Route, and find it very interesting. I just wish you have chosen a better contrast looking pair of colours for the text; black in grey is a no-no. Also, i wish success to L’Alliance project. To all free souls in the world, cheers! Thank you Jah, we appreciate your encouragement! And thanks also for sharing your opinion about our graphic choices: we will make the gray background brighter! Thank you for establishing L’alliance. I reckon it well honors Henry Wakeman & Bernard also as the later often regaled us with tales surrounding L’alliance and often these had Capt. Wakelam central to Bernard’s plot anaway. heap’a good on ye, eh? Bernard Moitessier refers to Henry Wakelam saying “A boat once perished because a box of matches had not been put in its place”. What is the story here? Que bien chicos ,siempre para adelante.Es una hermosa historia Met,que les deparara el destino en cuanto a historia ,un abrazo desde Mar del Plata Argentina. Wow, that sounds so alternative and inspiring. Probably any anarchist woman would like to be a housewife, if just the man was genious enough to make it clear that sharing both childcare and construcion work would never be an option. Apart from those feminist issues i enjoy exploring your information-loaden web-site, really. Hi fishmont, you’re right, that’s a good point: I will change that annoying “had to take care” in a somewhat softer “was mostly taking care”… however this won’t really change the story. Henry Wakelam is not an anarchist, and we never pretended he was. We admire him and we give him so much importance because he his among the most brilliant D.I.Y. 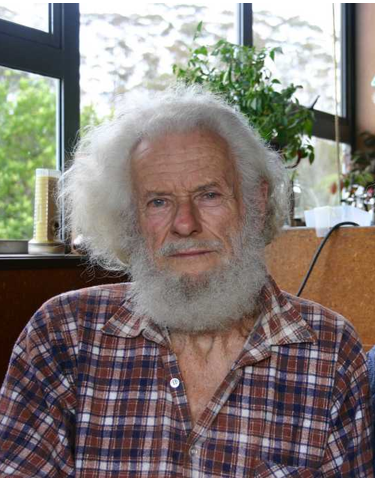 geniuses of the sailing world, and nowadays, even if settled on land and aged 82, he still follow a radical DIY lifestyle, in harmony with Nature and at the antipodes of the consumerism we all are merged in. Hey matello, i’m glad you care. However they were actually feeling about that situation, at least this text doesn’t assume that she “had to” anymore and leave it uncommented, as if it was ok.
keep in touch, fair winds! Janet from Toronto 1958…remembering when we met at the CNE…. My friend is sending this message as I do not use a computer! I have an etching of you that you may be interested in seeing.